(1) Do nothing. That’s right – do nothing. If you are not looking to sell your house or refinance in the next year or so, you can do nothing and see whether the lienor files a construction lien foreclosure lawsuit. The lienor has one year from the recording of the lien to file the lawsuit. (2) Record a Notice of Contest of Lien. The Notice of Contest of Lien shortens the lienor’s statue of limitations to foreclose on the lien from one year to 60 days. If the lienor fails to foreclose on the lien within 60 days, the lien is extinguished by operation of law. This is the route I tend to prefer. If the lienor is going to file a lien foreclosure lawsuit, I tend to think it is better forcing the issue on the front end as opposed to waiting a year. But every situation is different. (3) File a lawsuit against the lienor to show cause why the lien should not be discharged. In this type of show cause lawsuit, the lienor has 20 days to foreclose on its lien (typically, through a counterclaim) or else the lien is cancelled of record. This is an aggressive approach. (4) Serve a Request for Sworn Statement of Account. If the lienor fails to timely respond within 30 days to the Request for Sworn Statement of Account, you now have the statutory defense that the lienor lost its lien / lost its lien rights in the event the lienor elects to foreclose. Serving a Request for Sworn Statement of Account can be done in conjunction with any of the above approaches; however, if you take the aggressive approach and file a lawsuit to show cause, you will want to wait the 30 day period to expire to see if the lienor responds. (5) Transfer the Lien to a Lien Transfer Bond. If you don’t like the fact that the lien is encumbering your property, you can transfer the lien to a lien transfer bond. So, instead of the lienor foreclosing its lien as to real property, it is foreclosed against the lien transfer bond. This option can be done in conjunction with any of the above options and can be implemented after a lienor files a construction lien foreclosure lawsuit against your property. No matter what option you consider pursing, I would strongly recommend that you work with an attorney. Don’t be a penny wise and pound foolish by trying to draft documents on your own. Sure you can. But an attorney can help you ensure that (a) the option you are pursuing is the best option for your interests and (b) the option you pursue is done correctly. 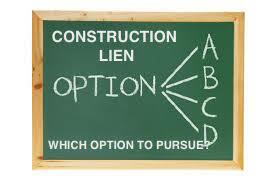 This entry was posted in Lien and tagged construction lien, lien, lien transfer bond, notice of contest of lien, order to show cause, show cause lawsuit, sworn statement of account by David Adelstein. Bookmark the permalink.